There are two lap chuns (Feb 4 or the beginning of spring) in the Year of the Fire Dog. The Chinese always welcome a year that has a double lap chun because this means greater prosperity and additional wealth luck,” says Lillian Too, a prominent feng shui expert and author of bestselling feng shui books. In the Year of the Fire Dog which begins on Jan 29, the economic outlook is a great deal better than in the previous Year of the Rooster. It is important to note that while the lunar new year starts in January, the feng shui predictions begin on Feb 4. Expect good wealth luck at the start of the year and also at the end of the year. Feng shui master Lillian Too (centre) at Feng Shui Extravaganza 2006. According to feng shui, the Fire Dog Year is productive because fire produces earth. The element of the stem is fire and the element of the dog, the branch of the year, is earth. So 2006 should be a productive year, she says in an e-mail interview. This year, Fire and Earth industries should do well, while Metal industries will have a harder time. To benefit from wealth luck this year, place a water feature in the North, the East or the Southwest, says Too. Also, place a dog image gazing at the moon – better a dog that looks like gold (metal energy because metal produces water) in the North for good income and money luck. Place in the East for good career advancement luck. Too says that on the morning of the first day of Chinese New Year (Jan 29) between 7am and 9am, open any window or door that is facing North. This is the direction of the God of Wealth for that day and it is really excellent if you get a “Wealth God” beforehand and, then at the right time, walk into your house carrying it and walk from the North direction. On Feb 4, you can also welcome the Wealth God, which will come from the Southeast. However, it is not advisable to do so because the God of Chaos is also coming from this direction. The five ghosts are also coming from the Southeast on this day. What’s her advice for people whose zodiac signs are not so good this year? Her advice to those who might be in for a challenging year is to “lie low.” There is no need to expand, just stay stable. The Dragon, Rooster and Horse have different kinds of bad luck to contend with. The Dragon confronts the Grand Duke so use the pi yao (a feng shui object which looks like a chimera) and make sure you do not confront (sit facing) the Northwest direction. The Sheep is also indirectly afflicted but it is not so serious. The Rat will have a good year although he should be careful of betrayal from friends. The Tiger and the Ox will enjoy good heaven luck and will benefit from unexpected windfall luck. The Rabbit enjoys excellent career luck and will emerge winner in a race to the top. There is success luck for the Rabbit. The Sheep and the Monkey will enjoy completion luck and can lay the foundation for future prosperity. So he can start new ventures. The Dog and the Boar will benefit from peach blossom luck, which suggests love. The Rooster will have misfortune luck and should protect itself from the wu wang (Five Yellow star) energy by wearing or displaying the five-element pagoda. This is a metal element cure that is powerful in this period of Eight. The Horse could get cheated, while the Snake and Dragon might succumb more easily to illness this year. Some people might think that because it is a Dog year, you may not place Dragons in the house. This is incorrect. Too explains: “The Dragon is the most powerful symbol in feng shui. This year, people born in the Dragon year may be hurt initially due to the conflict with the Grand Duke. However, they become stronger at the end of the year. What are this year's auspicious colours? Too recommends blue or black to indicate yang water energy. To benefit from the year's chi energy, you need water. This is because the element essence of the year is Wood (not Fire or Earth) in the paht chee (or Bazi or Eight Characters) chart of the year. And the Wood needs to be strengthened with Water, before you can benefit from all the goodies that the year brings, so wear blue or black. 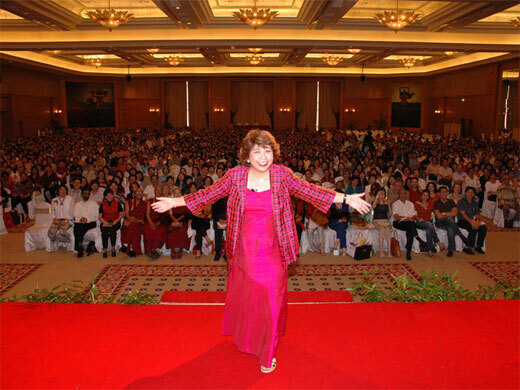 For more on the outlook for the year, visit www.wofs.com or tune in to Astro Channel 15 for a full playback of Lillian Too’s Extravaganza over the Chinese New Year period.